Members of staff at IITA Abuja station participated in a tree planting exercise to mark the milestone of 50 years of our existence as an institute. The event took place on the 3 November 2017 within the IITA Abuja station premises with a large turnout of staff who contributed to the planting of over 70 trees including ornamental and economic trees such as sycamore, African apple, breadfruit, kolanut, cocoa, avocado, citrus, mango, and guava. Each member of staff was given the opportunity to choose a tree to be named after and cared for by them with the hope that the long-term ties to IITA will continue for generations to come. Considering the hot climate of Abuja, these trees will beautify the work environment while mitigating the impact of climate change through reforestation. The Head of Station Gbassey Tarawali and Beatrice Aighewi, Yam Seed Systems Specialist opted to plant sycamore trees, a unique tree known for its longevity and hardiness while Debo Akande planted a cocoa tree, whose fruit is a major ingredient for the chocolate and cosmetics industry. 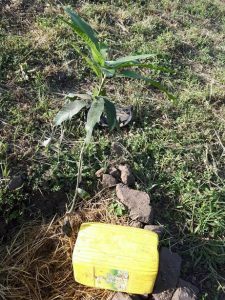 Philip Idinoba planted an avocado pear tree, whose fruit is rich in vitamins and potassium and able to lower cholesterol levels. According to Olurotimi Famodile, Abuja Station Administrator, “The importance of trees in our work environment and communities cannot be overemphasized as evident in IITA’s vision of promoting sustainable natural resources management as a long-term benefit for future generations”. Aighewi noted some important steps to be taken to ensure that the trees survive the dry period including the use of recycled plastic bottles to serve as drip irrigation for each plant. As Abuja station goes green, we can only imagine the massive impact we can make on our work environment if every IITA employee plants one tree. A popular proverb says “The journey of a thousand miles starts with a single step”… endeavor to plant a tree today!!!! !